The Spanish Air Force, the Spanish Navy, the Spanish Army, aerobatics champions, and international performers both civilian and military take to the skies in light aircraft, helicopters, sea planes, state-of-the-art jets and even a passenger plane for a colourful and sometimes ear-splitting show of flying technology both old and new. 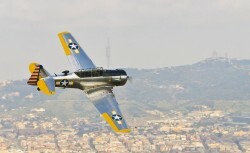 The Barcelona air show celebrated 20 years in 2011 and continues to go strong. There were many amazing parts of last year’s air show and thankfully all seem to be present this year. Although the Spanair Airbus 320 is now a Vueling one thanks to their untimely demise. But seeing an Airbus so close up and doing what are quite frankly aerobatic moves for an Airbus was one of the highlights of last year. It was a plane you could actually relate to. What can I see at the Festa al Cel this year? There will be World War II planes like the famous British Spitfire and the American favourite, the Mustang. The Polikarpov I-153 Chaika, a direct descendant of the ‘Chato’ will be on display, one of the last open cockpit combat biplanes. The Chato was the fighter plane that defended the Barcelona skies during the Spanish Civil War. The Bravo 3 Repsol Team will put on an amazing aerobatic display that will seem a little too close for comfort. 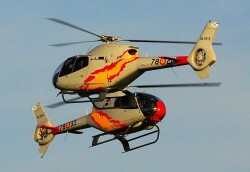 The Patrulla Aspa helicopter display team will be in action as will helicopters from the Guardia Civil and the Mossos d’Esquadra so you’d better be on your best behaviour! There will be precision flying from Red Bull Air Race pilots and a pyrotechnic and light display from the SWIP Team. And in case that all gets a little out of hand the Air Tractor, nicknamed “Zapatones” by their pilots, will be there to land and scoop water from the sea. These are the first to get to the large bush fires of Catalonia. These are just a few of the displays that will be happening on Sunday. If you are a complete aerospace nut you can watch them all come in to Sabadell airport on the Friday evening. And training on Saturday afternoon too. The full air show programme is yet to be finalised but some details have been added and it will hopefully be updated in full very soon. If the sun is out this is a perfect way to spend a late morning/early afternoon on a Sunday before heading off for that all important lunch. No, none of them meant much to me either until I read about them. So I suggest you check out the Performers page on the Festa al Cel website where they sound far more interesting. This is the Festa al Cel music video from last year’s air show. Hopefully this will get you in the mood. I’ve found it has an annoyingly addictive soundtrack. And if for some reason Saturday night was all too much and you can’t get off of the sofa then you can catch it all on the Esport3 TV channel that will be broadcasting live from the event.